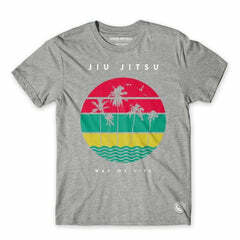 Show your support for your favourite jiu-jitsu brands with our range of BJJ t-shirts. Ideal for everyday wear, we have all of the latest designs from iconic jiu-jitsu t-shirt brands including Progress, Scramble, Kingz and Roll Supreme. We also stock a range of our own Fighters Market EU unique BJJ t-shirts with striking designs and comfortable fits. Our jiu-jitsu and MMA t-shirt range includes signature logo designs and prints in a range of colours, whether you’re hitting the gym or heading to watch a fight, you can always show your allegiance to your favourite jiu-jitsu brand. If you’re looking for jiu-jitsu t-shirts to wear when fighting, we recommend checking out our range of jiu-jitsu rash guards for performance wear designed to protect the skin. Whether you’re looking for a jiu-jitsu or Muay Thai t-shirt as a gift for a fighter or you’re looking to stock up your wardrobe with your favourite BJJ designs, you can find everything you need at Fighters Market EU.